I was in the third grade when president John F. Kennedy was assassinated. He was buried on my 9th birthday. Since that date I have been fascinated with the history of American presidents and I own a large collection of presidential paraphernalia. 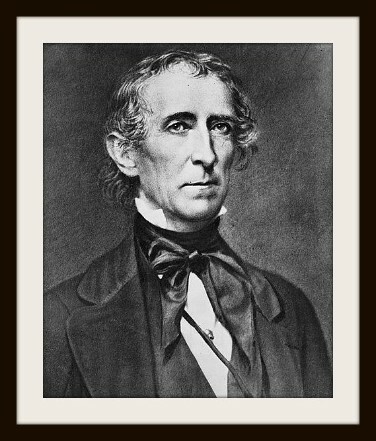 Below is an article I wrote about our tenth president, John Tyler. It first appeared in The Philomath Bulletin. It tells about the astonishing fact that as of 2010, our tenth president, born in 1790, had two surviving grandsons. The photograph of president John Tyler is courtesy of the Library of Congress. 85 year-old Lyon Gardiner Tyler, Jr. of Franklin, Tennessee and his 82 year-old brother, Harrison Ruffin Tyler of Richmond, Virginia could be described as living historical artifacts. But they are also living proof that the United States remains a relatively new nation. I thought I was somewhat unique in that my grandfather, Charles Parker Fulton, was born during the Civil War, when Abraham Lincoln was president. His youngest son became my father, but not until he was 54 years old. That means a mere three generations of my family now spans 145 years and all nine of my siblings are alive and well, ranging in age from 47 to 63. This amazed me until I heard about the Tyler brothers, grandsons of President John Tyler, who was born in 1790, during the first term of our first president! Curious to know if they were for real I contacted both of them. Their story brought to life the entire span of our nation’s history. John Tyler, who served as our 10th president from 1841-45, was far and away the most prolific father among our presidents. He was married twice and sired 15 children. He also had 44 grandchildren, born over an incredible span of 91 years! Tyler’s youngest child, Pearl Tyler, died in 1947 – 102 years after her father left the White House! Lyon Gardiner Tyler, Jr., born in 1925 and Harrison Ruffin Tyler, born in 1928, are the sole surviving grandchildren of John Tyler. Harrison still greets visitors to the Sherwood Forest Plantation, the historic home of his grandfather. He good-naturedly admits that visitors are “astounded” to learn that he is the grandson of the 10th President. Today, Harrison Tyler is an important benefactor of higher education and, not surprisingly, historical preservation. In 1996 he purchased and helped preserve Fort Pocahontas, a Union supply depot built by U.S. Colored Troops during the Civil War. In 2001 he established a five million dollar endowment to the Department of History at William & Mary College in honor of his father, Lyon Gardiner Tyler. It is hard to believe. But it is true. Lyon, Jr. and Harrison’s father was the 13th child of President John Tyler. Lyon Gardiner Tyler, Sr. was a distinguished and sometimes controversial historian who served as the President of William and Mary College for 31 years. President Tyler was 63 when his son Lyon was born. Lyon in turn was 75 when his son Harrison was born. In 1844 the recently widowed President John Tyler and several other dignitaries went for a short cruise down the Potomac on the U.S.S. Princeton. Captain Robert Stockton agreed to entertain his guests by firing off the Princeton’s big gun, which after several firings exploded, killing the Secretary of State, the Secretary of the Navy and four others, including David Gardiner, a wealthy supporter of the president. President Tyler personally carried Gardiner’s daughter to safety. The two fell in love and were married a few months later despite their 30-year age difference. The First Lady and the aging President may have set a May-December record for presidential couples but their son Lyon, born in 1853, would surpass that mark when, at the age of 70, he married Susan Ruffin, a woman 36 years his junior. It is worth noting that Susan’s great-grandfather, Edmund Ruffin, was born four years after Lyon Gardiner Tyler’s father, President John Tyler. Susan Ruffin had a significant family history of her own. Edmund Ruffin, with his signature white mane of hair, was an innovative agriculturist and Confederate firebrand who fired the first shot of the Civil War at Fort Sumter in Charleston, South Carolina. And it has been said that Ruffin fired the symbolic final shot of the war as well, when, draped in a Confederate flag, he committed suicide on June 17, 1865 rather than submit to Yankee rule. Susan’s elderly husband Lyon proved to be a passionate Southern nationalist himself. He wrote many books and essays about American history but the work that really made him famous was a blistering condemnation of no less an American icon than Abraham Lincoln. Tyler regarded Lincoln as coarse, vulgar, indecisive and overrated as a president and statesman. When the Virginia House of Delegates passed a “resolution of respect” on Lincoln’s birthday in 1928, Lyon Gardiner Tyler considered it an “excess of kindness.” Ironically, Lyon Tyler would die on Lincoln’s birthday in 1935. Harrison Ruffin Tyler, 82, does not remember his father, but 86 year-old Lyon Jr. does. What he remembers are stories that his father used to tell him about the adventures of a boy named Jack. But Lyon and Harrison Tyler are both well aware of the firestorm that their father created when he criticized Lincoln. Many scholars, including the prestigious African American historian John Hope Franklin, offered eloquent rebuttals to Lyon Tyler’s negative portrayal of Lincoln. That eminent historians would find it necessary to respond is perhaps a testament to Lyon Gardiner Tyler’s standing among historians. Lyon Tyler, Jr. traces the Tyler-Lincoln “feud” to February, 1861 when then former President John Tyler tried to avert Civil War by organizing and presiding over a Peace Convention in Washington D.C. It is true that John Tyler’s Peace Convention failed, but that was because the Deep South rejected it outright, refusing even to send delegates to attend. Most of the Northern delegates agreed with the “compromises” of the convention as a way to prevent war. But there was not much in the way of genuine compromise as Tyler gave in to the more conservative delegates and proposed constitutional amendments to protect slavery and even extend it. Grandson Lyon does not place the blame on Lincoln, as his father clearly did. But while they part with their father on his opinion of Lincoln, the Tyler brothers are ready to defend their grandfather’s decision to join the Confederate government. President Tyler’s surviving grandsons still admire their grandfather’s willingness to stand by his convictions. When asked what they think Tyler’s greatest contributions to American history was Harrison is quick to narrow it down. “Succession of the Vice-Presidency,” concludes Harrison Tyler, referring to the remarkable fact that it was John Tyler who established the tradition of the Vice-President succeeding the President when the President dies in office. This important contribution to the continuity of American government did not even become part of the Constitution until the 25th Amendment was ratified in 1967. Lyon Tyler, being the good history professor that he is, cannot narrow down his grandfather’s greatest achievement to one event or decision. But he is impressed with John Tyler’s contributions towards the realization of Manifest Destiny. The mere fact that two grandsons of the tenth president of the United States are alive should be an example to us all. It shows how brief our tenure as a nation really is. Yet it is also difficult to fathom. Lyon and Harrison Tyler are the last of the forty-four grandchildren produced by eleven of John Tyler’s 15 children. Two of those grandchildren, first cousins to Lyon and Harrison, died 168 years ago. Another first cousin, John Tyler Waller, the son of their Aunt Elizabeth, was killed in action as a Confederate soldier during the Civil War. Some young people today consider American history as ancient and irrelevant, but for at least two living Americans, Lyon and Harrison Tyler, our history is just three generations old.